Apple's latest MacBook Pro features a revamped display that's brighter, has greater contrast, and marks the first Mac notebook to gain wide color support— a particular boon for photographers —all while consuming 30 percent less power. Apple first introduced wide color support in its products with the all-in-one iMac desktop —a logical place to start, given space constraints are less of a concern with a stationary machine. Somewhat surprisingly, however, wide color next came to the 9.7-inch iPad Pro, and then in September made its way to the iPhone 7 and iPhone 7 Plus. Mac notebook users waiting for more faithful color reproductions from photos were finally granted their wish this week, when Apple unveiled its next-generation MacBook Pro with Touch Bar. While the new dynamic display bar above the keyboard garnered most of the attention, the new Retina display on the latest MacBook Pro is a major upgrade in virtually every way. Wide color support allows more lush and vibrant greens and vivid reds that traditional displays cannot reproduce. Specifically, Apple says the new P3 color MacBook Pro screen displays 25 percent more colors than the previous-generation sRGB screen. By displaying truer-to-life pictures across the iPhone, iPad, desktop and now notebook Macs, Apple now allows photographers to see accurate reproductions of their work regardless of where or how they choose to get work done. 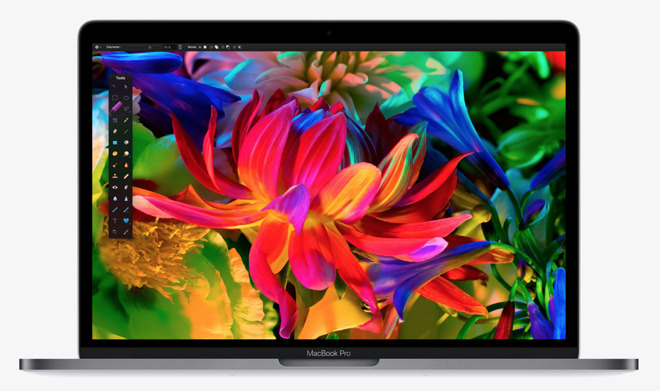 Beyond wide color, the latest MacBook Pro display is 67 percent brighter than before, measuring 500 nits brightness. And yet the display panel on the new professional-grade notebook is the same thinness as the 12-inch MacBook Retina display— which does not support wide color. In addition to brighter LED backlighting, the new MacBook Pro also has an improved contrast ratio that's 67 percent higher than before. This promises deeper shades of black and even brighter whites, which will even further benefit photographers running Apple's latest notebook. The new late 2016 MacBook Pro is set to begin shipping in mid-November.